We get a lot of questions to the Pro Tools Expert podcast every week, many fall into the same categories again and again. These can often be solved by knowing some Pro Tools basics, here are 8 Pro Tools basics you can’t afford to ignore. Some will make your system work better and some will help speed up your workflow, consider them the essentials to having a much more productive life with Pro Tools. Knowing how to set-up your audio engine in Pro Tools is the difference between smooth operation with low latency or stuttered playback and cryptic error messages that are going to bring you to tears. Take time to learn how to set this up, this differs between different version numbers and between Pro Tools and Pro Tools HD/HDX systems and different machines. Some of it is down to trial and error, but as a rule of thumb you are aiming to keep your Playback Engine down to the lowest amount of samples possible when recording to reduce latency, without Pro Tools falling over. When you mix you can push your samples up to the max when you need as much power as possible and latency is no longer an issue. Audio Tracks - These are for recording audio from mics and line inputs etc. Aux Input - These can be used for effects returns and sub groups internally or for external inputs into Pro Tools from hardware devices that you do not need to record and want to keep live. Master Fader - This is where all the audio ends up in a mix, you can add processing such as compression, dither and of course check your final output is not clipping. MIDI Tracks - Used for recording MIDI information to be sent either to internal instrument plug-ins or external MIDI hardware. Instrument Tracks - A combination of a MIDI track and an AUX Input track allowing the user to record MIDI and playback the audio of a virtual instrument on one track. Video Track - Yep you guessed a track for the playback of video. Knowing what track to use will help keep your sessions tidy, speed up your workflow and in many cases may also save your system power. Check out our guide to Pro Tools Instrument tracks here and our guide to Aux Tracks here. There are 3 things to remember before you press record on any armed track; name the track, name the track, name the track. If you ignore this then you’ll have sessions filled with clips called “Audio_01” etc. trying to sort this lot out is almost impossible especially if clips go missing. Send a track like this to a professional for mixing and expect a slap. 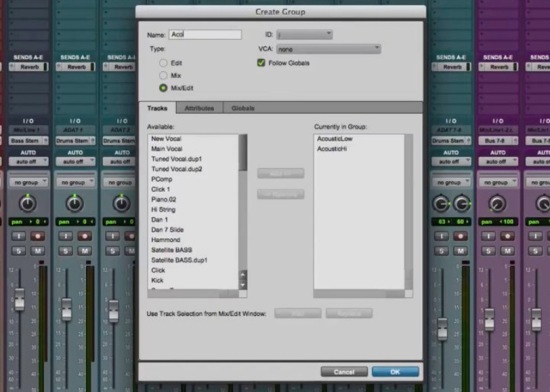 Playlists allow the user to create multiple versions of the same track, for example several takes of a vocal or guitar solo, or in group mode multiple items like an entire drum kit or orchestra. The user can then select the best take or comp a ‘perfect’ take from all the takes of one part. Watch how we get a perfect guitar part using Pro Tools playlist. There are times when you need your audio to be tight on a grid and other times when you need to be able to slip it around, or when you copy or delete audio you may need everything else to shuffle around. As a post editor you may need your audio to be spot on with a picture cue. Pro Tools gives the editor all of these options. 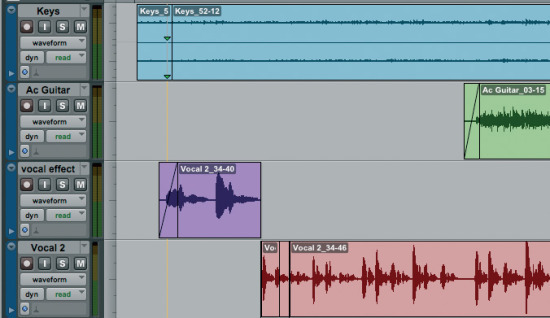 Learn how these modes work and you can fly around a Pro Tools edit using these Edit Modes. Watch our video here. Groups are the way to take control of complex Pro Tools sessions, they allow you to be able to Edit and Mix multiple tracks at the same time. Check out our video here. Spend any time with a professional Pro Tools engineer and you’ll see them seldom use the mouse, instead they use keyboard shortcuts to fly around a Pro Tools session. It doesn’t take long to develop muscle memory and become a Pro Tools Ninja. Ignore keyboard shortcuts at your expense… really. These are just some of the basics everyone using Pro Tools should know, but ignore any of the ones shown above and you’ll not have a happy time using Pro Tools.